Cats are obligate carnivores, which means they get all of their nutrition’s out of other animals. There are many different producers of cat food, but not all of them are as good as another. Here is your guide to feeding your cat with their specific nutritional requirements. Cats are obligate carnivores, unlike dogs and humans whom are omnivores. This means that cats get all their nutritional needs met by the consumption of large amount of animal-based proteins. Their digestive system is build around getting the nutritional needs out of the meat and will not be able to get them out of plant-based proteins. As such are grains such as wheat, corn and rice as well as potatoes not useful for your cat. So cats are meat eaters. Why is it than that we should not feed them raw meat? Raw meat is cut from an animal that has been dead for a while. The cuts are made before the meat comes to the store. Even if you buy your meat from a butcher, the meat is often for a long enough time out that it will get surface bacteria. If you would buy meat in frozen substance and meat was frozen right after being cut and right after the animal was killed, even than you will get surface bacteria’s as soon as you let the meat thaw out over a long period of time in the fridge. It is not the meat that is dangerous, but the bacteria that are thriving on the surface of the meat. These bacteria are not only dangerous to a cat or a dog, but also dangerous to us, as you might know. E.Colli and Salmonella bacteria are known dangerous types. So all meat from stores should be thoroughly baked so that the bacteria’s are killed. Baking the meat is better than boiling it in water, because through boiling in water, a lot of nutrients are flushed. When baking it in the oven, the fat can be contained and added back to the meat. How can cats eat animals like birds and mice? Simple, animals that are alive do not contain these harmful bacteria yet. Your cat will kill the animal and then (almost) immediately eat it. But when an animal has been dead over a longer amount of time, no animal or human would eat it anymore, for all the same reasons as that piece of meat from the supermarket. Taurine is something that cats get from meat-based proteins. It is not in plant-based proteins at all. If cats do not get enough taurine, they can get blind and will eventually die from it through heart problems. Back in the 1980s cats were having this problem and then they discovered that it was due to the missing taurine in plant-based protein cat food. After that they started adding chemically produced synthetic taurine to cat food. In the same way they add a lot of chemical produced vitamins and minerals. An animal contains a lot of water. Cats are not that good water drinkers, so dry food can become a problem for them. Dry food or kibble does not contain enough water and a cat therefore needs to drink a lot of water extra, especially since the dry food will swell up and absorb all of the water in the stomach. Wet food contains a lot of water. It is perhaps more expensive, but it will at least give your cat enough water content. 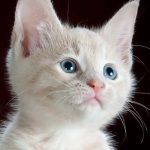 The problem is that cats do not have enough drive to drink water as they are built around the concept of getting their water need through animals. Not enough water intake means problems with your cats’ urinary tract, bladder and kidneys. In the animals that your cat kills and eats should generally be all the vitamins and minerals it needs. So your cat does not need fruit to get enough vitamine C. Some fruit and vegetables are even poisonous or harmful to cats. Plant based food is full of carbohydrates. Cats are carnivores and live solely off animals. Animals contain protein and fat. 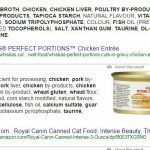 In the cat food available in most stores are unfortunately a lot of carbohydrates and other plant-based proteins a cat’s digestive system cannot do anything with. There is a lot of info lately around cat food production. Cat food is processed meat and a lot of things have been added to it to give it enough volume and taste. Will a cat survive on this type of food? Well yes it will.. survive it will, but the question is whether it will thrive on that type of food. And the ingredients seem to cause (and have caused in the past) a lot of diseases in cats. Just like with humans, processed foods do not do well on the health. You are better off staying in the grocery section of the supermarket and in the same way the cats better stay with the natural way of food. All the same, one can wonder whether your cat will have a good life by eating the wildlife in your neighborhood. Mice and rats and birds might have all sorts of diseases themselves or might be infected by lice, ticks and worms and other parasitic creatures. Also, what do these birds and mice eat? Food that they found in our garbage? So if a cat would have to live solely from wildlife as is available in current society and in your neighborhood it is yet again a question whether that will be a nutritious and thriving lifelong experience or a very short one. How are your experiences? Share your comments below.